Noah's Crossing is a small, fictional town in northwestern Wisconsin with church ice cream socials, summer carnivals, and Fourth of July parades. It's the kind of town where everyday people struggle to learn to love God and each other. What better backdrop for heroes and heroines to fall in love? Jessie Chandler is used to heartbreak. But she’s also used to blessings. Before her sister died, she gave Jessie the gift of a lifetime, her baby son, and Jessie is joyfully dedicating her life to raising little Jake. It isn’t until she meets Dr. Peter Sheridan, her sister’s colleague, that Jessie begins to fear heartbreak might win out. Dr. Peter Sheridan never wanted to be a father. Finding a cure for neurological disease demands his full focus, and he has no room in his life for anything else. But when he sees Jake’s little face, the spitting image of his own, Peter realizes he can’t turn his back on his responsibility to his child even when he has no earthly idea how to be the daddy his son needs. Wanting the best for Jake, Jessie agrees to help Peter learn to take care of his son, even though losing the toddler she loves will destroy her. But in the shadow of her sacrifice, can Jessie and Peter discover another of God’s blessings… that through sharing comes the greatest love? Instant Daddy is the first book in the Noah’s Crossing series, by Carol Voss. This inspirational story of family and love is approximately 57,000 words. Maggie McGuire can’t remember when she didn’t love Tony Stefano. Growing up together in the rolling hills and forests outside Noah’s Crossing, Wisconsin, the two had been inseparable, spending sunny summer days swimming in Rainbow Lake and rainy ones huddled in her treehouse sharing the best secrets. Tony was Maggie’s closest friend, and as teenagers, one day their friendship blossomed into more. Run out of town by a vengeful sheriff, Tony disappeared to parts unknown, leaving Maggie devastated and with a secret she couldn’t share. Ten years later, after Tony’s grandmother falls ill, he rides back into Maggie’s life on his Harley, as if nothing has changed. Something Maggie only wishes were true… because although it’s too late, she knows she must tell him he’s a father, and there’s no way to do that without breaking his heart… and risking her own. 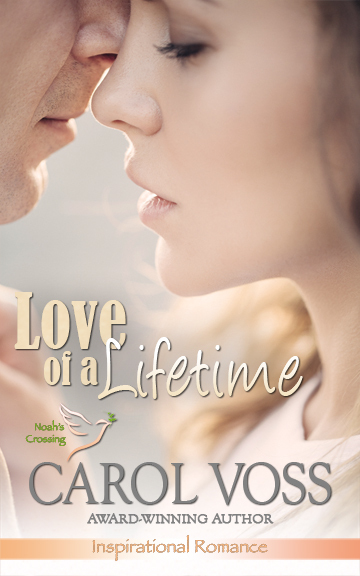 Love of a Lifetime is the second book in the Noah’s Crossing series by Carol Voss. Emotional, inspirational, and poignantly romantic, this novel is approximately 57,000 words long. From the time she was born, Alyssa Douglas was told who she was supposed to be, first by her father and mother, then by her ambitious husband. But in the blink of an eye, her husband passed away, leaving her on her own to raise their two sons… and to determine who she really wants to be. Alyssa returns to Noah’s Crossing, Wisconsin, the only place on earth she ever felt comfortable in her own skin. But when a fire nearly destroys her cabin on Rainbow Lake, Alyssa finds herself relying on her kind and handsome neighbor, Ben Cooper—a single father with problems of his own—instead of standing on her own two feet. As wonderful as Ben is, Alyssa can’t let herself love him. Not until she builds a life to call her own. Can she learn to trust God and embrace the blessings He has given her? Daddy Next Door is the third book in Carol Voss’ Noah’s Crossing series. A loving story of faith, second chances, and community, this inspirational romance novel is approximately 57,000 words long. ﻿﻿​Have you ever had an idea that seemed too big to think about? A God-sized idea? Sarah Taylor has an idea like that. One that keeps popping into her consciousness in spite of her attempts to dismiss it. But she’s too busy, too afraid, too inadequate to undertake such an idea. Isn't she? Sarah Taylor wants a lot from life; her own business, time with family and friends, a husband... but the thing she wants most is a baby of her own. Problem is, the closest thing to falling in love she's known is a crush she's been nurturing since kindergarten. But when the adoption agency calls with a bundle of joy meant for her, Sarah is gung-ho. There's only one thing missing. Will Kennedy is the perfect guy for… well… anybody. An ambitious lawyer with a heart of gold, Will has worked his whole life to help troubled kids. And since there are only so many in small town Wisconsin, he has his sights set on New York. With Will acting as her lawyer, Sarah is sure to adopt the perfect baby. But neither of them are ready for what else they find. And when their feelings for one another threaten to blow apart their carefully laid plans, they must learn to trust that God has His own. 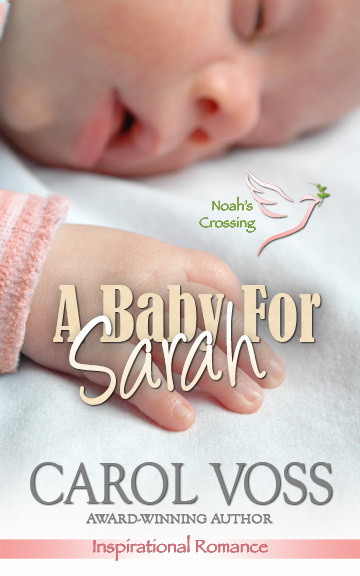 A Baby for Sarah is the fourth book in Carol Voss Noah's Crossing Series. An inspirational novel of family and the gifts we all have to give, this sweet story is approximately 58,000 words long.